United Nations Children Funds (UNICEF) in collaboration with National Youth Service Corps (NYSC) on Tuesday took U-report campaign and health initiative to Ngade Alha community in Birni-Gwari local government area of Kaduna State. U-report, which is an initiative of UNICEF and NYSC is a social short messages services (SMS) programme designed to address community issues including health, environment and other emerging challenges that may pose threat to locals. The programme is currently running in Burundi, Uganda, Zambia, South Sudan and the Democratic Republic of Congo. “We are leveraging on availability of team of corps doctors who will be here for few days testing, diagnosing and treat minor ailments they can handle within while those with serious health issues will be referred to appropriate health facility in town. “Like I said, two programmes are running concurrently; health initiative for rural dwellers and U-report. NYSC health initiative is aimed at touching lives at the grassroots and to show them that, they have not been forgotten while U-report is a free social SMS designed to help the locals to report happenings around them in their preferred language. “U-report is to amplify the voice of the voiceless on medical, environment and other emergency. It is free across all networks in Nigeria. We are flagging up the report here in Kaduna this year’s week though is going on simultaneously across the country. 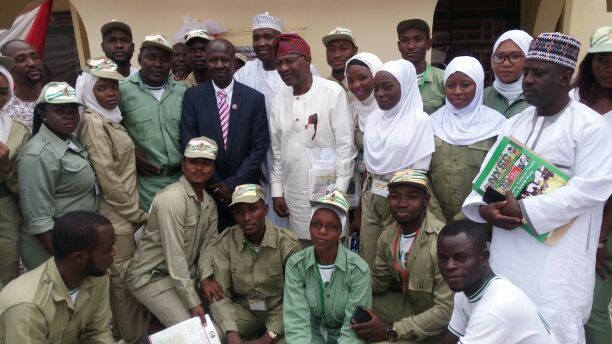 Earlier, Secretary to District head of Ngade Alha, Mallam Habibu Ngade thanked the NYSC for the initiative, calling on the state Governor, Nasir El-Rufai to help his community with a primary healthcare facility to help their women and children have access to improved healthcare service delivery as being enjoyed by those in towns. The U-report is targeting 5 million team members and targeting 140,000 in Kaduna but presently having 61,338 team members in the state. Anybody that is 18 years and above can participate by text JOIN to 24453 free across all networks.